AG and Sons: Know your diamonds! Diamond the hardest material existing, is also beautiful enough to be used as a jewelry that can adorn you. Jewelry with diamond studs and solitaire is quite common now. Whether it is a set of a number of small diamonds or a single huge solitaire, it is bound to add to your beauty much more than any other stone. The most sought after gemstone, diamond has used as a decorative item since ancient times. 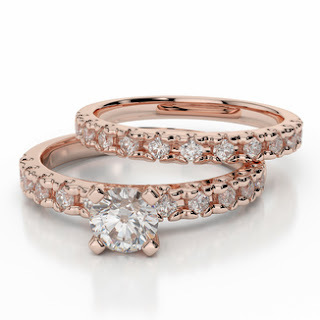 The most use of diamonds is in the engagement or wedding rings sets since ever. It is also used in necklaces and earrings but that use has only been since modern history. A chemically pure and perfectly structured diamond has no color. Most of the diamonds used for jewelry are usually impure; the slight color in the diamond comes from the structural imperfection. Depending on the intensity of the hue in the diamond, it may either enhance or reduce its value. Most white colored diamonds are cheaper because of the slight yellow color that is detectable, while blue or pink colored diamonds are rare and quite expensive. Diamonds have been naturally found in almost every color of rainbow. Diamond is not all that pretty as a rough stone, it needs proper cutting and polishing to be formed into a gemstone. Cutting of a diamond is an art and science. The diamond cutting technique is has been developed over thousands of years. Process of creating a beautiful diamond that can form the center of your ring is quite strenuous; at the same time the variety in which diamonds are available is also huge.